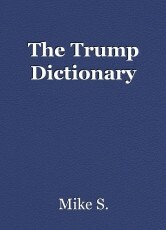 The Trump Dictionary, short story by Mike S.
Humble--hum-ble--just another word I have no idea what it means--a word coined by Democrats to make me look bad--fake word. They don't think I'm very smart, but they're just ugly dogs anyway. Presidential--pres-i-dent-ial: a word that Democrats say I'm not, well, I got your 'presidential' RIGHT here! Poopy-head!!! Lol! Mike this is a great parody on the state of things. Welcome to Trumland where the leaders are dumb and the president is dumber. Thanks, Joy, and I know immature!